This past Saturday afternoon we had an enjoyable visit at the lovely new home of friends in West Vancouver. Afterwards the two of us made a spur of the moment decision of have dinner on the sidewalk patio of one restaurant in the charming Dundarave community. Afterwards we stopped at Ambleside Park for a stroll by the sea. The sun was low in the sky, the air was balmy but not at all hot with no wind. Many boats and some ships out on English Bay. People were still enjoying their picnics, children played in the playground, on the sand and in the ocean. We stopped for a bit on a bench to watch this world go by. 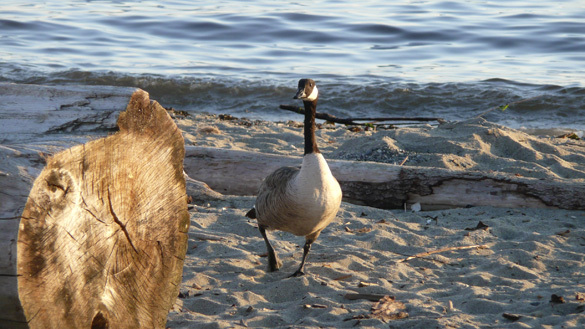 A lone goose on the beach spotted us and began to walk up to us. A young family with a little boy in stroller joined us. The friendly goose came right up to the boy, probably hoping for a snack. Disappointed, it turned back towards the water’s edge. 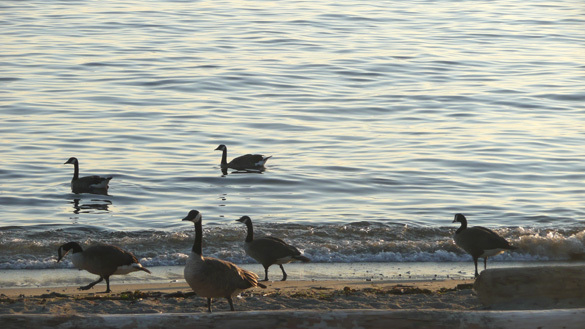 Meanwhile a whole gaggle of geese further down the beach marched or swam to join him. We even spotted a human swimmer amongst them. A delightful evening in a favourite spot. Especially like the second photo of goose and little boy eyeing each other. Looks like a lovely afternoon for all. Martha, that is one of my favourites too. The weather was so perfect, not too hot like it has been all July. We’re now back to another heat wave so I think of that evening longingly. It looks like a lovely spot for sea watching in good company. I like the picture of the little boy, but the first one with the lone, proud goose is very neat. They are elegant beasts even if they can be a nuisance sometimes. Susan, I’m glad you liked the first photo and see what intrigued me about that goose. All these geese seemed so attractive to me the way they moved on the sand and in the water. Our Saturday night entertainment it was! Beautiful colours and elegant shapes, very atmospheric. I didn’t see the goose head periscope in the second one at first! They obviously aren’t aggressive,but I’m not sure I’d want to swim amongst them too much, if only from the point of view that I’ve seen how much guano they generate! Lovely pictures of serenity. 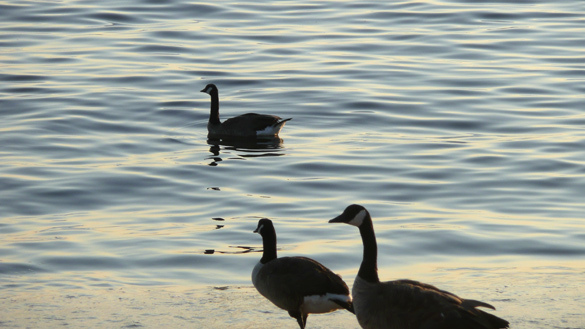 And Canadian geese, like Hawaiian geese are such gentle creatures. How can they do anything but bring a gentle smile to one’s face. Lucy, ‘goose head periscope’ – hah, good one! Thanks, the lovely setting did attract my eye and camera and I’m pleased how these turned out. 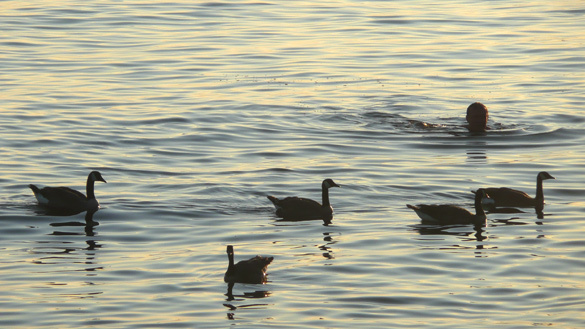 And I agree, I’d not want to swim with geese, not just for the guano but in case one nipped me! I’ve been chased by a barnyard goose once upon a time. Tom, thanks, serenity is certainly the right word for this scene. It amazes me how these creatures live so calmly amongst humans, even as they are a problem with overpopulation and their messes. I still remember your story about your face-to-face meeting with a swan in your response to my post about goslings. What a summer you are having. It is warm in Seattle but I sense the approach of fall. We are off to Sweden on Sunday. Hattie, yes, it is quite the summer, continuing very hot and very dry. The only hint of fall’s approach is that the days are getting shorter. Two bloggers that I read have been or are in Finland. Now you will be in Sweden – have a great time! !